When I read about a self-storage warehouse in Croydon burning down on New Year’s Eve my thoughts went out to the customers who had lost thousands of pounds worth of belongings. One woman spoke of losing crates full of photos… all her memories, all her cards and letters from her family. Can you imagine how devastating it must have been to have lost such personal items? Of course the same is true for any business that may have trusted important documents to a nearby lock up or just left them in the company warehouse, untracked and gathering dust. We have thought very carefully when it comes to making sure our buildings are safe and secure for your precious documents. Our facility is monitored 24/7 and linked into the all-important fire services as well as the police. Each and every aisle has a smoke detector and we are in complete control of who and what accesses the Filofile premises. 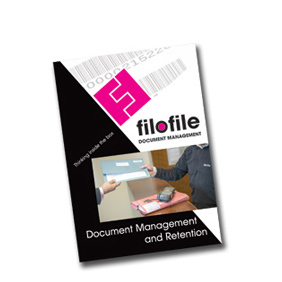 All of these measures work to protect every single document under the Filofile roof because we understand the problems associated with keeping documents. 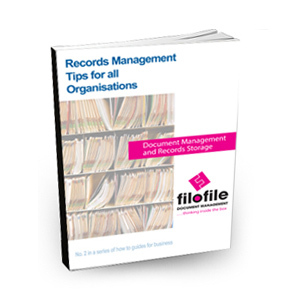 Our cost effective records storage solutions offer you the peace of mind that your valuable documents are well cared for. How does it all work? Well, we start by supplying you with Filofile storage boxes, we then arrange to collect the boxes from your premises, register and barcode them into our world class records management system and store them in our highly secure climate controlled storage facility. If you need access to your documents at any time, we can easily retrieve them for you. These days there is a trend for a minimalist look in both office and home, and space comes at a premium so does it make any sense to try and store documents and valuable files on your own premises or at home – particularly when they could be at risk of fire, floods or theft. 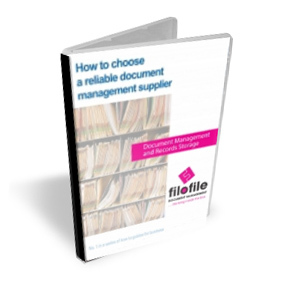 The Filofile document management service is cost effective, provides full traceability, reduces your cost of renting space to store documents and gives you complete peace of mind. You can trust us and we are fully ISO 9001 compliant. Please contact us for advice on how this may work for you and for a free quote contact us.